A rainbow flag in Rochester, NY has raised some tempers after an official said that the Monroe County Office Building in Rochester would not be flying the flag for the city’s Gay Pride week. In a report by the Democrat and Chronicle, Monroe County Executive Maggie Brooks argued that it was “not county practice to “fly ‘issue-based’ or ‘advocacy’ flags” at the county building,” but a number of county legislators decided to display the rainbow flag from the building anyway. 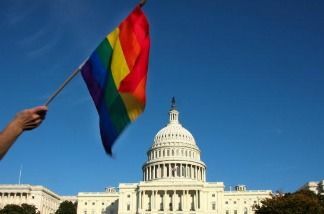 It isn’t the first time the rainbow flag has been the source of controversy in recent months. In 2012, a similar controversy erupted in Seattle, when officials nixed a rainbow flag from being flown atop the city’s Space Needle even though it had been raised in the same location for at least two years during LGBT Pride weekend. Posted July 23rd, 2013 & filed under News.